For Jane's end-of-the-year class party I found out we were invited/supposed to/allowed to bring little treats for the other kids in her class. 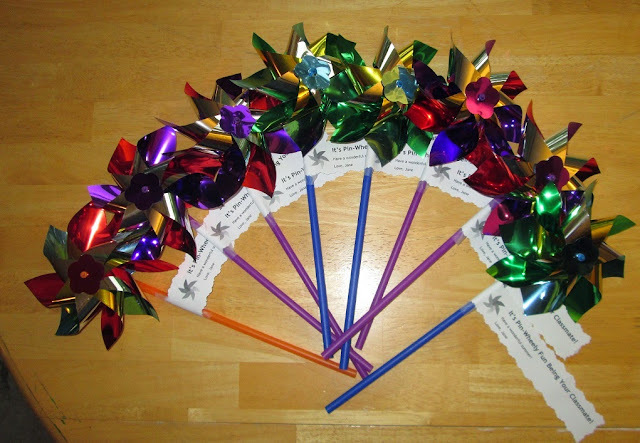 I ordered some pinwheels from Amazon -- I got a dozen for around $5, and I attached a small tag that says "It's Pin-Wheely Fun Being Your Classmate." I thought this was VERY clever, and not something I'd seen on Pinterest (although maybe I missed it? ).